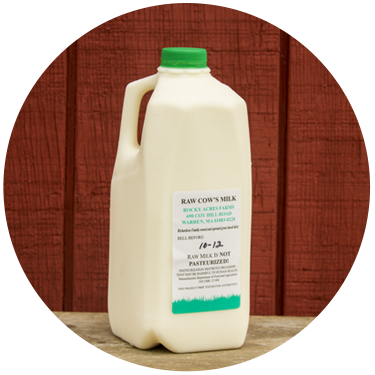 Milk is available seasonally, from late March through Christmas. 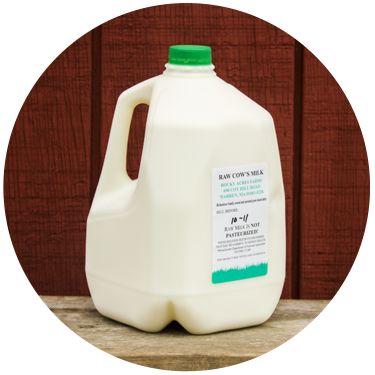 All milk must be pre-ordered, as we bottle fresh each day based on the orders we receive. This is done to ensure that every bottle of milk purchased by our customers is as fresh as possible, thus extending the shelf life. To Order: Call 413-436-5806 and leave a detailed message with your name, phone number, how much milk you would like, and what day you would like to pick it up. To Order: Email rockyacresfarm@verizon.net with the same information, and you will receive an email back acknowledging that your email was received. ALL orders must be placed by 9 am to ensure same day pick up. All milk will be ready to pick up at 11 am daily. We also accept standing orders if you would like to always have a certain amount of milk ready for you the same day every week. For example, if George wants 2 gallons every Friday. When you arrive at 690 Coy Hill Road in Warren, MA to pick up your milk, you will see the barn on the right hand side of the road. Head towards the barn, where you will find our milk room. You will most likely be greeted by our dogs Kya and Scout, but no worries- they are friendly! Just inside the door, there will be a fridge on the right- that is where the milk will be located. There is a white board on the fridge- all names will be listed for people who placed milk orders, with the number of gallons/half gallons ordered. Please cross your name off the board. If you have any questions, it is usually easy to find one of us around the barn! Example Order: Sally wants 2 gallons of milk for Monday morning. Sally calls the farm number, (413-436-5806),at 8 am Monday morning, leaving a message for 2 gallons of milk for Monday pick-up. After 11 am on Monday, Sally’s milk will be ready for her to pick up. If Sally needs to pick up her milk before 11 am Monday morning, then she needs to place her order before 9 am on Sunday morning to ensure that it will be in the fridge for her when she arrives.